Even with all the chaos that comes with having an extra set of kids (see earlier post) around the house, Luann and I were able to finish up getting the garden prep'ed for spring planting. We decided to plant in a second area, as the first still has a few plants that are not done with the cycle. The garden now covers twice the area, and will be on fully automated watering. That is really the only reason that this works for us. We used way less water once it was automatic, what with the prevention of over-watering (read: forgetting to turn the water off), and the ability to fine-tune the amount via the duration. The plants you see are: (foreground) Broccoli, (against the wall, short) Carrots, and (against the wall, tall) Sunflowers. There are some Garlic, Potatoes, Tomatoes, and Onions hidden in there as well. Yesterday, G-man, Kiwi, and Mr S got to spend an entire day with another family's kids. The parents had to be out of town for various reasons, so their three kids stayed at our house for the day. And, those three kids are almost the same ages as ours. It was a beautiful day outside, and much of the day was spent outside. Using the new climbing dome, they built a nice little fort. There was so much room, the fort was complete with a kitchen, an area for the pets, and a parking space. Of course, there was plenty of sitting areas. Oh, did I mention that the food was both real lunch, and a big pot of mud soup, with a touch of sand. And, the best part was that the pets were termites from the yard. Fun for all! And, the highlight was the cool afternoon snack of Rainbow gelatin! Post Script: Today at church, in talking with the Dad of the friends, we found out that not an hour after the kids got home (at around 7 PM), they were fast asleep. And, they didn't get up until 7 AM. We wore them out. Luann finally got in to see the midwives to "make official" the due date. The heart beat was fine, and the due date stayed at the 26th of July. I think that Luann knows how to calculate the date after three kids, so no surprise on the date. 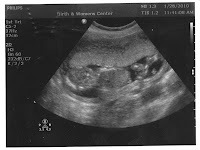 And, the midwives' office has a new ultrasound machine, so we have an early picture of the baby. In this picture, the legs are cross, and the head is on the left side. G-man: I have to write this down, because it was the best thing about Christmas morning at our house. G was the first one up out of the kids that morning. He's always been our early riser and for whatever reason he never gets up until after he hears someone else awake. Chad and I woke up to him using the restroom, then he hopped right back in bed. Within a few minutes he started singing Christmas songs. Silent night, away in a manger...He started out soft and then got louder and louder until Mr. S was awake. Once his little brother was awake they came in a snuggled in bed with us. Within a few minutes the singing started again. I know his ultimate goal was to get his sibling out of bed so he could open presents. I couldn't think of a sweeter way of getting it done. Kiwi: We ventured into the land of Barbies this year. I've been resisting for quite a while. Mostly because girls love to take their clothes off but can't dress them, so you end up with a home full of naked 6 inch tall women. I find it creepy. But, we tried polly pockets and those are impossible to dress, everything but the doll and clothes get lost, and the clothes/dolls get ripped and broken (because they are impossible to dress. Kiwi was given a Princess Tiana and Prince Naveen doll from for Christmas. She loves them, but the thing that disturbed me the most was how often they were playing face to face. What is she doing with these dolls? Are they talking, dancing... kissing? I really didn't know she was into the whole boy/girl thing. But then she was flirting and playing chase with my friend's nephew during a Christmas party. Do girls really get into this so early? I'm sure it depends on the girl. I'm not ready for this one. Mr. S: This guy's vocabulary is skyrocketing. He's finally speaking clearly enough to be understood and loves it. He'll repeat a word (getting louder and louder each time) until you acknowledge that you hear and understand what he's saying. His recent obsession is with a book about"Things with wheels." At the end of the book is a dump truck pouring a load of dirt on the ground. He'll grab the book and ask dirt? while holding his hands in a questioning gesture. Then he flips to the back of the book to show you that he found it. He then repeat about 10 times. Very cute, but starting to get tiresome. You can only hear the same one word sentence so many times in a row...I think it's time to hide that book. And now, a moment of silence for the coolest Christmas present EVER. I think it is now our goal to one up Santa every year. Sure, Santa got you a scooter, but mom and dad got you something that could potentially cause you to break your neck. How awesome is that? With all the madness that is the end of the year, and with extra vacation time that was expiring at the end of the year, I have been on vacation for the last week and a half. Here are a few pictures from Christmas that are good enough to share. I think this was the first time that there was real excitement from the kids in having Christmas. They are getting the anticipation thing down flat. As for the presents, the climbing dome is by far the most fun, as they have been spending a lot of their winter vacation outside climbing and hanging around on the dome.